State teams, clubs, players and Football Association of Malaysia seem dragging their feet against errant teams tarnishing the image of the M-League. Now in its 26th edition, the Super league kicks off tomorrow, moving into a new era as a privatised entity. But the same old woes exist even though the league went semi-professional in 1989 and professional in 1994. The Professional Football Association of Malaysia’s (PFAM) revelation on Tuesday that 21 players were owed salaries amounting to about RM4.47 million from last season by three teams is not a good start to the new season. That Kelantan, for example, are talking about painting their stadium pink and changing the colour of their jerseys - having secured sponsorships worth millions - when they have not settled dues, leaves a bitter taste in the mouth. Although their current sponsor is not liable to settle debts from the previous season, Kelantan AFA, when negotiating, should have discussed this matter and worked it into the terms for this season. Whatever said, KAFA are responsible for all liabilities. That established teams and high spenders like Kelantan, Armed Forces and Felda have been implicated does not augur well for the image of the M-League. Armed Forces still have not settled in full dues owed to their former coach, B. Satianathan, despite a directive from FAM to do so. PFAM president Hairuddin Omar is among the Armed Forces players whose salaries are in arrears but the body has been openly snubbed. Clearly, Armed Forces are not threatened by it. To make matters worse, Armed Forces have signed two contracts with players in clear violation of professional football ethics, not to mention labour and employment laws, falling foul of the requirements of the Employees Provident Fund (EPF), income tax and Social Security Organisation. While these teams have violated the rules, regulations and contracts, the players, especially those from Armed Forces, are partly to be blamed. They should not have signed two contracts. Some of the players claim they were forced to sign and that they were at the mercy of their employer on landing a contract for the season. Then, when the FAM’s – the Players’ Status Committee’s – decision that the teams concerned should make immediate payments is not honoured, and the national association does not act on the defiance and total disrespect of their affiliates and clubs, it points to weakness on their part. FAM has to be firmer on these issues. Also, whether FAM were aware that some players were signing two contracts need to be answered. That it did happen, FAM are still at fault of not addressing it. PFAM CEO Izham Ismail admitted that the local football players were wrong in signing two contracts and said they were in the process of educating their members so that they do not become victims because of greed or compromise their rights. At the same time, Izham said, the separate contracts signed with Armed Forces are legally binding. Why all these complications? Players’ greed? Teams enticing players and holding them at ransom? FAM’s weakness? Lack of professional players’ knowledge about their rights? Incompetent team management? A situation that needs to be addressed immediately before the M-League is better known for its idiocy than popularity. That FAM are issuing a show cause letter to PFAM for their statements which the national body claim was damaging and inaccurate, is also alarming. If PFAM, the body for supporting the players are challenged, it does not augur well for the future of the game. If anything a forum or meeting should be called to trash out matters as both bodies are working for the game. Even before the start of season, we have teams that have made a mistake in hiring weak foreign players and wasting valuable money. For instance, Penang FA have off-loaded their Brazilian striker Jose Tadues for close to half a million ringgit while Johor Darul Ta’zim (JDT) have relegated another Brazilian striker, Paulo Rangel (a former Selangor and Terengganu player), to play for Johor in the Premier League. How professional is this? There are probably many other such cases that have not come to the media’s attention. It is sad that so much money is being wasted because of poor decisions while local players are being taken for a ride over their wages. Without doubt, management by the states and clubs in the M-League is far from professional, with the exception of a handful of teams like JDT. Maybe it is time for the new managers of the M-League – Football Malaysia Limited Liability Partnership – to seriously manage a professional league with probably only eight teams that are truly professional and banish the rest until they learn to toe the line. Let us not have a professional league just for the sake of having a professional league. We have done it for the past 30 years and nothing much has changed. Teams are still very much amateurs in many of their ways and hardly meet the criteria of professional teams. Let us get our act together once and for all, before Malaysian football becomes a joke! The last thing the Professional Footballers Association of Malaysia (PFAM) want is to get on the wrong side of FA of Malaysia and have been engaging the national body since their formation in 2014. FA of Malaysia general-secretary, Datuk Hamidin Amin had said that PFAM was not a sanctioned body to represent the players in the wake of the latter’s revelation that 21 players from three teams having arrears in wages from last season. PFAM chief executive officer zham Ismail said they registered with the Sports Commissioner’s Office on 4th Aug, 2014 and have been a member of the International Federation of Professional Footballers’ Associations (FIFPro) since 22nd October 2013. FIFPro has a Memorandum of Understanding (MoU) with Fifa as of 2nd November 2006 which was signed in Barcelona by then Fifa president Joseph Baltter and FIFPro president Philippe Piat. 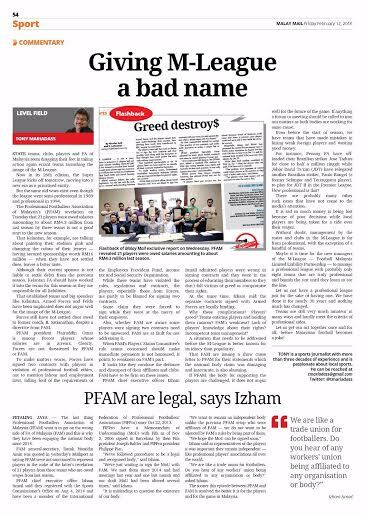 “We have followed all procedures to be a legal and recognised body,” said PFAM CEO Izham Ismail. “The only thing we are waiting is to sign a MoU with the FA of Malaysia. But we have been meeting the national body since 2014 and have meetings in 2015 and one last month,” revealed Izham. “But our draft MoU had been altered several times and have been going back and forth. With us engaging FA of Malaysia all along and the MoU in the process to be signed, it is misleading to question the existence of our body. “The last thing we want to do is to antagonise the governors of the game in the country. We want to have a cordial relation working in the best interest of the players and the game. “However, we want to remain an independent body unlike the previous PFAM setup who were affiliates of FAM. “We want to work closely with FAM but want to able to voice our views independently. We do not want to be silenced by FAM rules by being part of them. Izham said that as representatives of the players it is important that they remain independent as Professional Players’ Associations are all over the world. “We are like a trade union for the footballers. Do you hear of any workers’ union being affiliated to any organisation or body,” asked Izham. The sooner this episode between PFAM and FAM is resolved the better it is for the players in the M-League and the game itself in Malaysia. The last thing we need is a running battle with these two organisations who are working for the game.